Dark elves are pretty sweet, you know? They're like elves, only cooler. 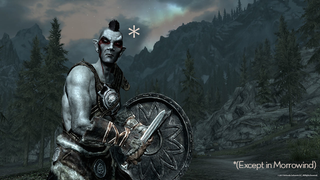 In Skyrim, dark elves—known in The Elder Scrolls lore as the Dunmer—were relegated to a ghetto in a single city. But if you played Morrowind, you got to interact with them a whole lot more often. That's because Morrowind the game is set in Morrowind the home province of the Dunmer, and dark elves are as common in that game as Nords are in Skyrim. The people working on Skywind, the incredibly ambitious Morrowind remake that's rebuilding the 2002 game in the Skyrim engine, say they're releasing the game soon, but they need help. It sounds like they need help with lots of stuff, but voiceover, in particular. Partly, they have to go through all of the voice files and figure out which ones are keepers and which need to be re-recorded. But they also need actors, specifically actors who can do the dark, growly voice of a dark elf.